Installing prefinished hardwood flooring is always a pleasure, because the installer and client almost immediately see a great result. 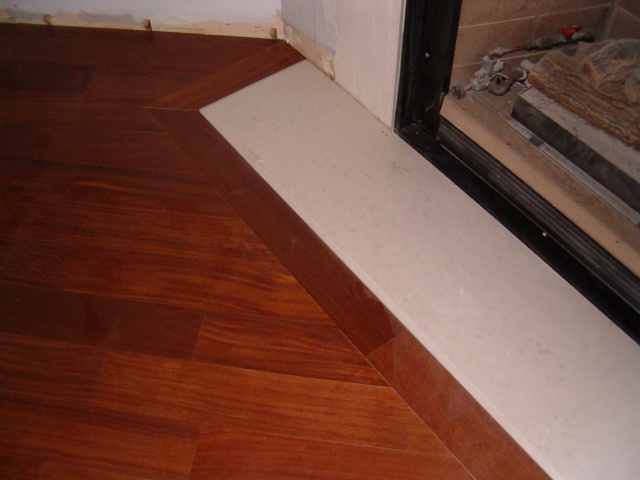 Due to the characteristics of the subfloor or simply at the whim of a client, they may ask you to install this type of hardwood by the glue down way method and at this time you will need to pay close attention. Skilled craftsmen do not recommend DIY homeowners to install prefinished hardwood flooring by the glue down method, since this requires a lengthy training. Even experienced floor installers are not always happy to take on this job. Glue is not smeared not on the floor boards, but applied in an even layer on the subfloor. To spread the glue on cement or wooden subfloor you need a tool such as trowel. It will take some time before you learn the skill to work with it. Even if you choose the correct size of the teeth, it does not mean that you will spread the glue evenly. What happens if you glue smeared on the subfloor unevenly? In those places where it is small, the boards can not quite stick. This is especially true of cheap material, which board’s are often curved. After this installation you feel that the floor “moves” under your feet. 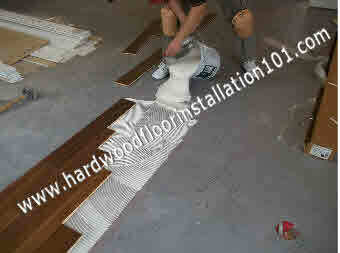 If the adhesive layer was larger than needed, it will appear on the surface during installation. Such oversight can “forgive” unfinished, but not prefinished hardwood flooring. When you first install hardwood by glue down, then you have to hurry to wipe excess glue with a clean cloth towel (not paper!). After removal of the glue, carefully check whether the surface of the hardwood is totally clean, so you do not have to do extra work after installation. Also check your own hands thoroughly and as often as possible. They should always be free of spots of glue, or you will soil all over the entire floor – one that is already installed, and pieces still left to install. The same goes for shoes. Inexperienced floor installers often step in the glue smeared on the subfloor, and without noticing their mistake, walk on already installed prefinished hardwood flooring. To avoid this, experienced masters recommend covering small areas of the subfloor with glue. Carrying out this operation over and over again, you will gradually begin to “feel” the size of the working area. This skill will help you avoid serious mistakes at work, will significantly increase the speed of installation, and your salary will also increase. The more you practice installing prefinished hardwood flooring by glue down, the faster you become a master of this kind of floor installation. 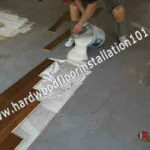 Of course, you can also practice this method by setting unfinished hardwood flooring, but if you treat the unfinished floor as well as the prefinished floor, your overall speed of installation will increase significantly.